This small church dedicated to St Kevin of Glendalough, was the last site visited on this trip to Gleanncholmcille. 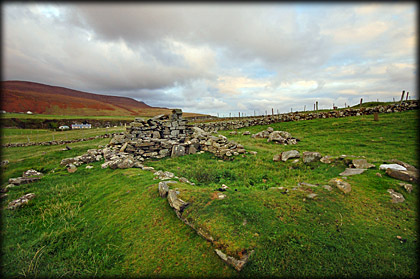 The site is situated on the mainland opposite the monastic hermitage on Rathlin O'Birne Island. The church is 3.6 metres in length by 1.8 metres wide. The east wall pictured left, is the largest remaining part of the church. There is a cross slab with a latin cross inscribed on either side associated with this church but unfortunately I was unable to locate this slab. Hopefully this was due to the fact that the light was fading fast and the slab still exists. 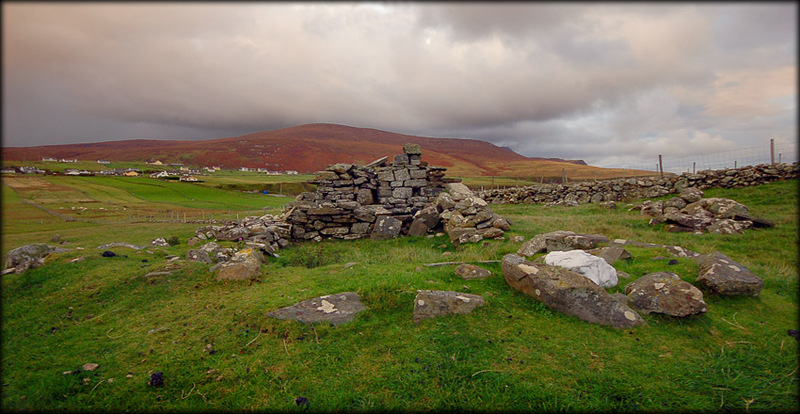 Situated: From Gleanncholmcille head west on the R263 to Malin Beg. At the crossroads in the village, take a right turn towards the pier (sign-posted). Go 500 metres down to the pier. A track runs west from here towards the signal tower. Walk 100 metres up the track and turn right down another track. The church in the field on your right. Discovery Map 10: G 4898 7991. Last visit Sept 2010.